Back in 1992 the Bord na Móna Gaelic Football Inter-Works Championship Final took place at Lanesboro’ for the very last time. That was a tough struggle between Mountdillon and Oweninny, perhaps memorable for the physical body clashes that occasionally occurred between the participants. After one of those ferocious body checks an onlooker exclaimed, “Jeeze did ye hear the souse of that”, and although the word “souse” means something completely different it seems to have somehow attained onomatopoetic qualities in this context. The match was memorable also for another reason, in the opening half on two occasions an umpire’s decisions were vehemently disputed. The arguments arose when one supposed and one definite Oweninny point were signalled wide – the latter even being acknowledged vocally as a point by at least one respected member of the Mountdillon team. After much remonstration with the referee, and an amount of vehement argument at half­time, a new umpire was procured and the game continued. Mountdillon were defending champions, having defeated Oweninny in the Final the previous year by a handful of points, and as our Roll of Honour here shows the Longford men have clearly been the masters of the Bord na Móna GAA football scene. Indeed the last three finals featured Oweninny and Mountdillon – the 1990 final was decided by a sideline kick taken in the last minute of injury time which entered the Oweninny net – the Oweninny goalkeeper later said he had been blinded by the evening sun. Oweninny had never won a championship, and this obviously spurred them on to even greater effort in the second half. Perhaps what occurred then could be described as a titanic confrontation, with warriors on both sides prepared to give everything to the struggle. Having had a player sent for an early shower, the Mountdillon stalwarts played like men possessed. With seconds left it seemed that Oweninny had finally achieved success by the slenderest of margins -but a Mountdillon point in the dying moments put paid to that notion, leaving the issue undecided. Mountdillon, seeming to have more in reserve than their opponents, asked to play extra time. Oweninny declined on the assumption that under GAA rules extra time is only played after a replay, no one had mentioned before the match that should a draw occur extra time would be played, and anyhow the light was fading rapidly. Considerable argument with raised voices of course took place on the matter, but it was to everyone’s credit that common sense prevailed and those present held their heads. In a feeling of anti-climax therefore everyone went away feeling that a replay would be arranged – but it never was. The referee’s final whistle that day signalled the end of the Bord na Móna Inter-Works Championship for ever. The trophies were mothballed somewhere and forgotten and the final final issue left unresolved, but not forgotten since occasionally Scéal na Móna would raise the matter. Finally a query in the magazine of July 2003 as to what had happened to the trophies spurred Industrial Engineer Michael O’Sullivan, who uniquely works in both Oweninny and Mountdillon, to take the issue in hand with the full co-operation of the company’s Senior Management. To the credit of everyone involved, Michael found nothing but co-operation in both Oweninny and Mountdillon. The goodwill that has always existed between the GAA organisers of both Works was a motivating factor towards aiding Michael’s efforts. Particularly, it must be said, the former GAA organizing secretaries, Noel Rhatigan of Mountdillon and Eamon Howley [Sceal na Móna Correspondent] of Oweninny, both tireless behind-the scenes workers, had always been on good terms. The situation was basically that although the referee’s decision on that bygone match had been final, there were those in both Works who knew fair play had not been served. This sporting attitude, particularily among the Mountdillon players and organizers who after all could have stuck with the referee’s verdict, led to a unique decision being taken. Perhaps fittingly that final final would be divided between both Works with both names inscribed on the trophy. Has this ever happened before in the history of the GAA? 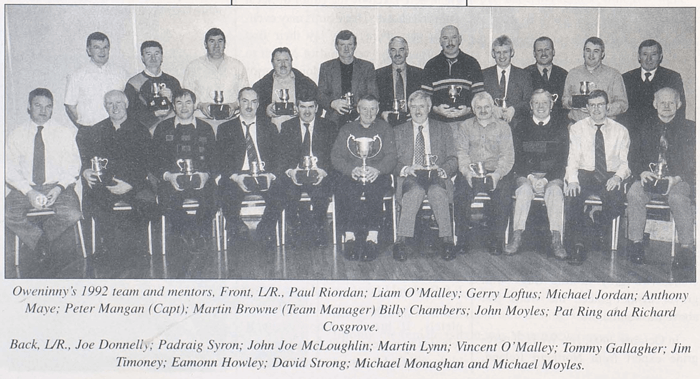 Accordingly, at a special function on February 21st in Ballina’s Downhill House Hotel, the players and organizers from both Works came together for what was billed as “The 34th Presentation of the Inter-Works Football Cup”. The occasion was given extra atmosphere by the presence of a number of the former Bord na Móna GAA “greats”, notably former Offaly footballer Eamon Fleming, who played on the Boora team which won the very first Interworks final of 1959; Cyril Dunne, formerly of Blackwater and star of the famous three­in-a-row All-Ireland winning Galway team of the 1960s (1964,1965,1966); Brian Delaney of Cuil na Móna who played at all levels with Laois and with the Laois seniors between 1966 and 1975; Seamus Flynn, the Mountdillon selector who played with the Longford Seniors between 1957 and 1971 and holds a Leinster Championship Runners­up Medal (1965) and National League Medal (1966); Larry Arthur, who played with Derrygreenagh between 1959 and 1995 and captained the last Rochfordbridge (St Mary’s) team to win the Westmeath Champion hips in 1962 (Larry brought along his famous squeezebox as additional entertainment), Jack Kenna of Laois who formerly played with Clonsast, Croghan, Derrinlough and Derrygreenagh, and holds 3 Railway Cup Medals, having played with Leinster from 1955 to 1962 and Laois from 1951 to 1962; and of course the Roscommon All-Star Player of 1980, Danny Murray, who won a National League Medal in 1978/79 and a National League Runners up medal in 1980 and was involved in Roscommon’s succession of Connacht Final victories between 1977 and 1980. Danny was a key player with Mountdillon for years and figured prominently in the 1992 Final. Tom Lucas, Bord na Móna’s Peat and Associate Businesses General Operations Manager, himself a former Galway hurler, was M.C. on the night. Tom was fullback on the Boora team that was managed and captained by Eamon Fleming and defeated Oweninny in the final of 1968. An enjoyable element of the proceedings was his outline of the history of the Inter-Works Tournament, interspersed with anecdotal reminiscences. He said that the only sad aspect of the night was the fact that two prominent Mountdillon players had died in the intervening years: Pat Mullooley (brother of the RTE Reporter Kieran) and Jim Smith of Derryhaun who died only a few days before the presentations. Solas na bhFlaithis da anamacha uasail. The first final between Boora and Derrygreenagh was played at Portarlington with a reception afterward at Clonsast Works. Mountdillon won ten titles in all and four in a row in 1988, 1989, 1990, and 1991. Before the acquisition of modern transport the players travelled to the matches in canvas topped lorries, and except in the case where receptions followed finals they paid for the meal after­wards themselves. As can be imagined wins were generally celebrated in the standard fashion and players became intoxicated – there was the case in Blackwater where a man turned up to work the next day looking for his false teeth -luckily they were found in the lorry. At a reception attended by Sceal na Móna a considerable amount of poteen was consumed during the meal under the hotel table and no one was the wiser it just all added to the jollity of the occasion. The criterion on what was required to be a good player sometimes had nothing to do with footballing skill, but perhaps staying power – Boora selector, Kieran Egan, once insisted that a certain man be included because he was “a sweet man with a shovel”. “Over 2,000 enthusiasts filed into the Tullamore GAA ground on Sunday September 13th in anticipation of an exhibition of Gaelic Football at its best, between the star studded teams of Bord na Móna and the ESB. Unfortunately however the game didn’t live up to expectations and we are sorry to report that the main reason was the non-appearance of eight of the ESBs selected team. From the moment Miss B. Flynn, Bord na Móna’s Chief Accountant, threw in the ball it was obvious that the ESB’s depleted team could not stand up to the all-round efficiency and quicksilver precision of the Bord na Móna stars. Jim Ryan (Offaly) and Kevin McNamee (Meath) were pillar of strength among the Bord na Móna backs, whilst Peter Moore (Meath) was unbeatable at centre field. Their main strength however lay in the football genius of their left wing forward combination of Seamus Leyden (Galway) and Tommy Green (Offaly). Every time this pair got the ball the ESB backs panicked. Leyden finished with a personal total of 4 goals and 3 points, truly a wonderful performance. In fairness to the ESBs team it must be said that they battled to the best of their ability and such as “Packey” Brennan and Kevin Coffey (Dublin No I), Peter Moore (Allenwood), Mick Donovan (Portlaoise) and in particular Joe Hannon (Sligo) added to their already high reputation. The final score was Bord na Móna 5-5; ESB 2-5. At the dinner which followed in Hayes’ Hotel, Mr McCarthy, District Manager, Galway, who was MC, called on Mr Murray the ESB’s Chairman to present the trophies to the winners. In a short address Mr Murray welcomed the inauguration of the competition which he felt would cement the good relations which already existed between the two organisations. Having congratulated the winners he concluded on the note that perhaps next year the ESB would reverse the decision and give Mr Lawlor, General Manager of Bord na Mona, the honour of presenting the trophies. In a humorous response Mr D. C. Lawlor made it clear that Bord na Móna also felt that staff activities such as this were desirable from many points of view. He shared with Mr Murray the hope that the game and associated function would become an annual event. In fact Kevin Coffey, the ESB captain, addressed the function in Irish, to which the Bord na Mona captain, Mick Devery (Boora), had to respond. Kevin, who played in four Senior All-Irelands with Kerry, winning two (1959, 1962) is the brother of Patrick Coffey, the former Bord na Mona Laboratory Manager at Newbridge. No other written results of these ESB /Bord na Móna encounters were found, other than an announcement in an Electrical Mail of October 1963 that “What is confidentially expected to be one of the highlights of the GAA Football curriculum is due to take place at Tullamore on Sunday November 10th when the ESB meet Bord na Móna in a challenge game for a valuable set of medals”. We do know however that Bord na Móna again defeated the ESB in 1965, since Brian Delaney still has the medal he received then. At the function in the Downhill House Hotel the trophies were presented to the two 1992 teams by Colm O’Gogain, Deputy Director of Peat and Allied Businesses, and perhaps the most memorable aspect of that unique ceremonious occasion was when both captains jointly received the cup and shook hands heartily. Tom Lucas said that with the Championship now defunct the cup would finally rest in safe keeping at Bord na Móna Energy Headquarters – to gather dust until perhaps a new race of warriors emerge to raise it again, for who can tell the future? After the presentation the players settled down to reminisce on past games and glory to the gentle strains of Larry Arthur’s accordion. * These statistics are supplied by Michael O’Sullivan. Unfortunately there are no records regarding what Works won tire cup in the following years: 1970; 1973; 1979; 1980.